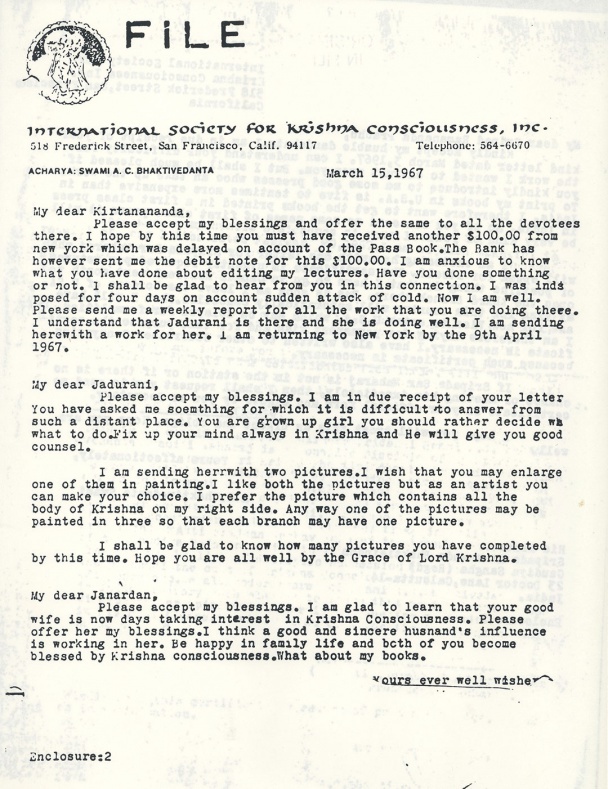 NTERNATIONAL SOCIETY FOR KRISHNA CONSCIOUSNESS, INC. Please accept my blessings and offer the same to all the devotees there. I hope by this time you must have received another $100.00 from new york which was delayed on account of the Pass Book. The Bank has however sent me the debit note for this $100.00. I am anxious to know what you have done about editing my lectures. Have you done something or not. I shall be glad to hear from you in this connection. I was indisposed for four days on account sudden attack of cold. Now I am well. Please send me a weekly report for all the work that you are doing there. I understand that Jadurani is there and she is doing well. I am sending herewith a work for her. I am returning to New York by the 9th April 1967.